The couple had talked about marriage before that night, of course. Pat Pulido knew the question was coming, and she assumed her then boyfriend, Manny Sanchez, was planning to pose it over an intimate dinner, where the two could enjoy great food and high emotions. “Well, it was far from that,” Pat says with a chuckle. Pat had flown in from St. Louis to attend an event with Manny at the Chicago Club. The 120-plus-person gathering was a combination 50th birthday party for Manny and an announcement that he was receiving the Raoul Wallenberg Award for humanitarian service (which now draws an eye from its shadowbox on the wall of his office). Unbeknownst to guests—and to Pat—the event would also serve as a public venue for a proposal. “I go to the mic,” Manny recalls, “and I asked, ‘How, when, and where?’” The audience was confused, so he repeated himself, “‘How? Hopefully, like this. When? Now. And where? Here! Pat, will you marry me?’” and took out a ring box. Everyone was stunned, Pat included. She stood up beside him, grabbed his jacket, and said, “How could you do this to me?” She took the box without opening it, said, “yes” into the mic, and only later did she remember to look at the ring. Managing one of the nation’s largest certified minority business enterprise law firms is no small task; it’s a long list of responsibilities. Manny’s firm handles a number of practice areas in tort, contract, commercial, employment, and statutory controversies. Manny’s reach stretches beyond Chicago’s borders, as well. In 2011, he received an appointment from President Barack Obama to the President’s Advisory Commission on Educational Excellence for Hispanics, where he serves on the early learning subcommittee. Pat moved from St. Louis to Chicago after she and Manny were engaged, but she’s no stranger to the Windy City. Her first position with Anheuser-Busch Companies was as corporate relations manager in Chicago. Today, Pat has more than 25 years of experience in strategic communications, which she leverages as president and CEO of her own firm, Pulido Sanchez Communications. She serves on the corporate boards of ITxM/LifeSource Congressional Hispanic Leadership Institute, Academy for Global Citizenship, and the National Museum of Mexican Art. Pat’s firm works with a number of high-profile clients to use applications such as Facebook, Instagram, and Twitter to strengthen a company’s brand and interact with its consumer base. Among these clients are the Consul General of Mexico, Crown Imports, and the Hispanic Association on Corporate Responsibility (HACR). Though Pulido Sanchez Communications started as a traditional strategic communications firm, it has grown to include an arsenal of tools, such as focus groups, strategic planning, and the integration of innovative social media technology. Step into the Sanchez home in the Chicago suburb of Lisle or their condo in the city, and you’ll see a collection of artwork and knickknacks from around the world. When the two travel, they interact with the world around them and pick up mementos along the way. At home they’re comfortable enough in one another’s company to focus on each other and keep to themselves. The couple’s average weeknight is spent in their Chicago condo, and it drifts between the mundane—Manny picks up something from Mariano’s, Pat cooks, and they watch TV together—to the glamorous—a political, civic, or philanthropic black-tie event after work, during which both weave effortlessly through a crowd that knows them well. Fridays involve a trip to the country club for dinner or cocktails with friends, and they finally relax once they’re out in the suburbs for the weekend. When we met one week in October, their schedules seemed like a whirlwind, and it was one of many such weeks they’d experienced in the last year. First they attended a gala thrown by the Kevin Spacey Foundation in Washington, DC and enjoyed a concert given by Spacey to support youth in the arts. Then they headed to New York City for dinner at the Rockefeller Center, joining guests including former president Bill Clinton, and participated in a powerful discussion on the global role of education. Next, they spent two days in Orlando, Florida for a golf outing and dinner hosted by the Kate and Justin Rose Foundation, which fights childhood hunger and supports early education. In between all of these appearances, Manny and Pat drove to Ann Arbor, Michigan, to visit their daughter, Andrea. 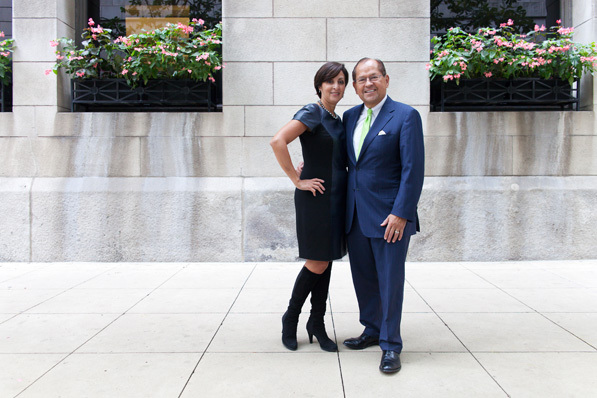 Manny and Pat are a fixture in Chicago’s philanthropic, civic, and political activism scene, and one rarely appears without the other, unless they need to make simultaneous appearances for different organizations. Both recognize the other as a partner in business and philanthropy as well as in their marriage, and they serve on boards and in capacities that complement rather than overlap or work against one another.